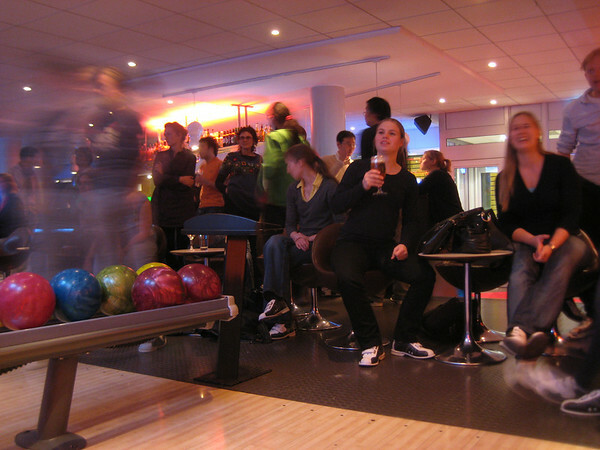 JenniferOur social committee here at the Evolutionary Biology Centre decided to have bowling as the Autumn Event. For some reason, bowling has become popular in Sweden in the last few years, and Uppsala dutifully has its 9-lane bowling alley, a place called bowlaget. The bowling here is strictly for entertainment purposes—lanes are somewhat shorter than regulation, the place is black-lit with flashing lights and relentless remixed hits from the 80s, and the bar is slick and swanky and staffed by black-clad thin young men who are much cooler than you are (80 SEK for a beer). It makes quite a contrast to a place like Kelley's Bowl in St. Joseph (where I worked for a few months in order to earn cash for my first trip to Europe, 'way back in 1985), with its serious people who brought their own balls, and dozens of well-lit lanes that were nevertheless totally obscured by cigarette and cigar smoke by the end of the evening. There's also an attached restaurant, which serves a traditional three-course bowling menu. The autumn offering is wild mushroom toast, steak with celery puree, and cloudberry pannacotta for desert (395 SEK, including an hour of bowling). Or you can go for the luxury meal (475 SEK), which gets you brioche for an appetizer, lightly smoke venison sirloin with port wine and cranberry sauce, and chocolate fondant with berries and ice cream. These offerings are also just a wee bit different from the snack bar at Kelley's, where for I think $1, your snack bar attendant (that's me) would throw a pre-packaged sandwich into the microwave for you. Bowling techniques ranged from a pure power (from a tall botanist, who threw the ball so hard that it didn't even hit the floor until half-way down the lane) to attempts at finesse (student E., who stood carefully at the line, but consistently hit the alley). Highest score I saw was 160, the lowest was under 20. Everyone had a good time—after all, the point of bowling, as far as I can tell, is to share a beer with friends, and a laugh about how bad you are.